Our horseboxes are built to order. With many years of experience in designing and building horseboxes we will ensure that your Winterborne horsebox will truly meet your needs. Each of our boxes is unique whether for pleasure riding, hunting, racing, polo, dressage, showing, eventing, carriage driving, endurance riding, studs or for professional horse transport. Through discussion we identify your specific needs and design a horsebox especially for you. 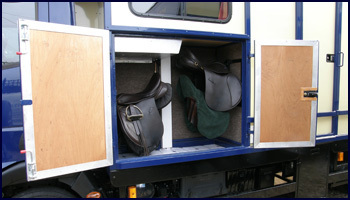 Almost any conceivable feature can be incorporated into your Winterborne horsebox. ● Under floor kit boxes for hay, buckets etc. ● Day living with seats, table, hob, grill, sink etc. It is important to select the right chassis for you and to ensure that it is the correct specification for your chosen box. We hold a stock of good quality, reliable used chassis cabs of various makes and models, since we usually supply both the chassis and box. We also source new lorries. Alternatively we will happily build on a customer’s own chassis. A lorry supplied by the Winterborne Horsebox Company will be thoroughly prepared, sprayed, serviced, plated and supplied with 12 months Annual Goods Vehicle (MOT) Test and road fund licence. We also build livestock, cattle, hunt (horses and hounds) and other animal transport boxes. If requested, we undertake superior box van conversions. 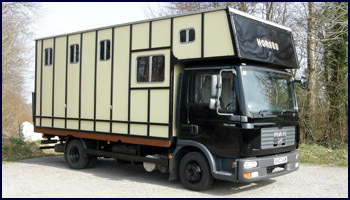 Selection of new and good used horseboxes available (see our New & Used Boxes For Sale pages).